The 1998 vintage for red Burgundies appeared to be on its way towards being quite exciting, until a bit of rain arrived in September. The question of quality centers on whether or not the particular estate had harvested before the rain. If not, then there's a question of selection and weeding out fruit that was not in top condition. 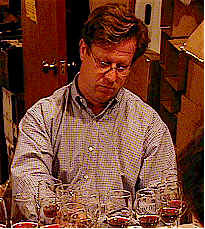 The experts contend the top wines of the vintage are of very fine quality. Tasting Notes Compiled by Gerald Weisl. One wisecracker said this is "Not bad for what you can do with a bag of C & H sugar!" Someone else characterized this as "thin," while another pegged it as being "high in acidity." Another critic found it to have notes of "cherry and tar...pretty simple wine." One taster found it very "extracted, with a dryingly tannic finish." Someone else echoed this sentiment, saying this is quite "bitter." One slightly more favorable comment: "It has a raspberry-like bouquet." I found the nose quite attractive initially, finding berries and cherries with a touch of oak. 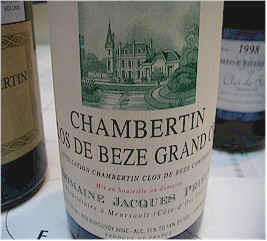 The wine has mild tannins and reasonably nice balance, suggesting 3-8 more years of cellaring. One star (three star scale, zero being average). Not much discussion on the Rodet wine, as one taster said it has "Metallic notes on the nose and palate." Another person found it to have a "cherry candy nose with a bit of complexity." A third taster found "Minerally, lime notes, dusty, dried thyme elements with a grainy and tannic mouth-feel that's unpleasant." My notes described this as having a touch of fruit and some forest floor notes with cocoa, herbs and a touch of oak. The root-like flavors are certainly all about Pinot Noir. Five to eight years' aging potential. One-and-a-half-stars. One taster found positives and negatives here, noting the "vanilla, oak nose with pleasantly bitter flavors, but it's thin and sour on the palate." A second taster described this as having notes of "mocha and dark cherry, but bitter on the palate." Someone else described it as having a "dusty" bouquet. I found some pleasant berry notes with a light bit of wood. It's an altogether nice wine, but is not going into the hall of fame. Three to six years of cellaring are warranted. One star. One taster found "red fruits, a waxy note, earthiness, ripe and complex with a short finish, but it has lingering violet, floral notes." Another said it was showing "Nice, sweet cherries and a sweet, buttery, oaky character at first, but then it turned sharp, with bitter, harsh tannins." One other critic felt it had "no fruit." Another said it "Started nicely, but it's hollow and fades quickly." I found sweet, ripe red cherry aromas with a light touch of oak. It's tannic and a bit astringent, though there's enough fruit to carry the modest amount of wood. Five to ten years + of cellaring potential. One star. One taster liked its "pork rind nose, but it's a bit thin, though good." Someone else said it's got "foward, chocolate cherry notes and it's tight and tannic with a short finish." A third person found it to be "bitter and sour at first, but it opened, with good fruit underneath the tannins." A fourth critic found "minerals and violets, with ripe red fruit, sweet strawberry and raspberry notes, together with a long finish." "Vegetative, tart cherry with a nice balance of acidity," were the words of yet another. I found this to be excellent, showing sweet oak, hints of bacon, vanillin, pencil shavings and more on the nose. The flavors echo the fragrances with a light bit of tannin. Five to eight years of cellaring. One-and-a-half to two stars. One taster asked if I had included a Zinfandel as a 'ringer' in this tasting. Another had the same question, describing this as "atypical Burgundy, but closer to Dry Creek Zinfandel." Someone else said this had a "nice finish and the longest finish" of the wines. "It's the most extracted," said another, adding "it's dark as hell!" Someone else said this must have been "soaked on the skins for a long time." I found hints of anise, Asian spices with deep blueberry fragrances and some blackberry and currants. It's not typical of Burgundy, but it's very interesting and complex. The flavors don't completely match the nose. Five to eight years of cellaring are about right. One star, with a caveat that it's not classic Burgundy. "If you like charred barrels, then this is your wine...it's tarry and shows vanillin, too." said the first critic. Another found "vanilla, wet earth with a sour note...nice fruit and oak, with clean flavors." Another described it as "Beautiful, with some barnyard and matchstick notes...toasted barrels, complex with dark cherry notes and nice tannins." One detractor found it "Elegant, but thin and sour," concluding it "doesn't have enough fruit." I liked the smoky, charry notes. There's a hint of a band-aid fragrance, too. The smoky oak dominates on the palate with mouth-drying tannins and a bit of fruit. Five to ten years of cellaring time. Two stars. "This has a really nice mouth-fell with a cherry-like flavor," said one critic, "but it's bitter at the finish." Another found it "soft and long on the finish." Someone else said it was a bit "cloudy on the appearance, but has nice structure, some smoky, roasted grain notes. Monterey-like Pinot with some herbal, earthy, barnyard notes." Another found "cherry notes and it's sweet and elegant in terms of fruit." Another found "raspberries and green herbs and it's softer and a bit more subdued." I found hints of a vegetal note with a touch of spinach, nice oak and some vanilla. The flavors are good and typical of Burgundy with a bit of astringency, too. Five to ten years of cellaring potential. One-and-a-half stars.